Cardiologists today must have adequate basic training in vascular medicine in order to care for patients with peripheral vascular diseases. However, the topic of peripheral vascular disease has been inadequately addressed in most training programs, and particularly in the literature directed toward cardiologists. 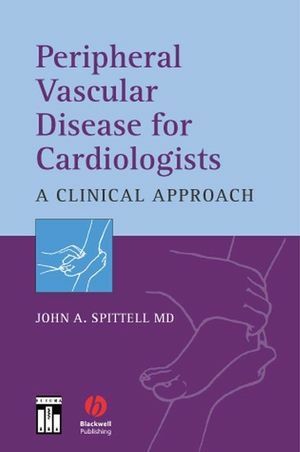 This text, the first of its kind, is intended to broaden their knowledge base and clinical skills in the recognition and management of the common peripheral vascular disorders occuring in cardiovascular practice. Peripheral Vascular Disease for Cardiologists will provide a practical, clinical framework rather than using the usual textbook format, hence fitting effectively within training programs in cardiology and internal medicine. John A. Spittell, Jr., MD is an internationally recognized cardiologist who is extremely well-published. This world-renowned educator has made a specialty of teaching vascular medicine to cardiologists. Either Kim Eagle, Professor of Medicine and Chairman of Cardiology at the University of Michigan or Valentine Fuster, Professor of Medicine and Chairman of Cardiology at Mount Sinai School of Medicine will be writing the preface. Chapter 1. Occlusive Peripheral Arterial Disease. Chapter 3. Aortic Dissection, Penetrating Atherosclerotic Aortic Ulcer, and Intramural Hematoma. Chapter 8. Leg and Foot Ulcers. Chapter 9. Vascular Clues to a Diagnosis. fills a need for cardiovascular specialists who wish to broaden their knowledge base and clinical skills in recognition and management of common peripheral vascular disorders that occur in cardiovascular practice. ispresented in a practical, clinical framework rather than the usual textbook format. a detailed index is included in order to facilitate rapid retrieval of information.